In yesterday's post, I shared the beauty of the Rocky Mountains while on a trip to Denver last weekend. Today, I share the rest: the bars we went to, the restaurants, the additional events... My brother played personal planner and packed our schedule with a bevy of fun outings, leaving Eric and I two very tired birds on our flight back to Milwaukee Sunday night. But, oh, was it fun. 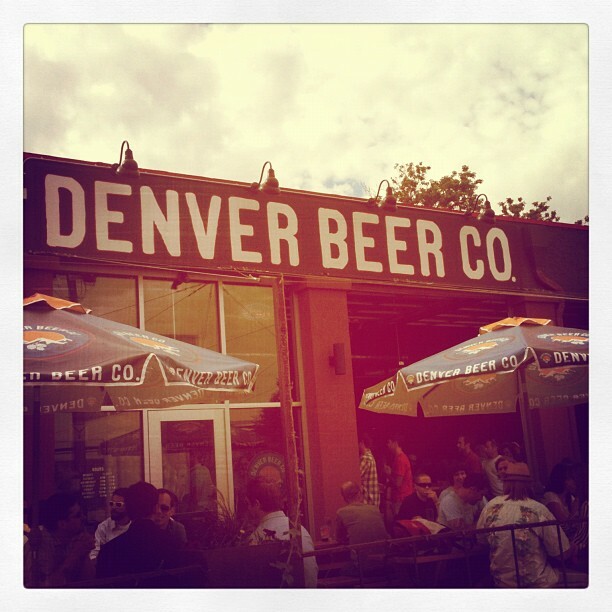 Shortly after dropping off our bags at my brother's house in Denver's LoHi neighborhood, we hoofed it downtown to grab some drinks before heading to the Colorado Rockies game. Our first stop was at the slick Denver Brewing Co, an open-air bar hosting nearly as many dogs has human patrons, which served up its own craft brews. I enjoyed the steady stream of bluegrass music, the laid-back industrial vibe and a Big Money Maple Nut Brown before we headed to the next bar. Swanky's "Vittles and Libations" is located a block away from Coors Field, and, simply, feels like home. We traveled halfway across the country just to wind up at a Wisconsin-themed bar right smack in Downtown Denver. The owner, who we chatted up about the Brewers while seated at the bar, is a Wisconsin transplant and pays homage to his home state filling his bar's walls, bartop and even ceiling with Wisconsin sports paraphernalia. 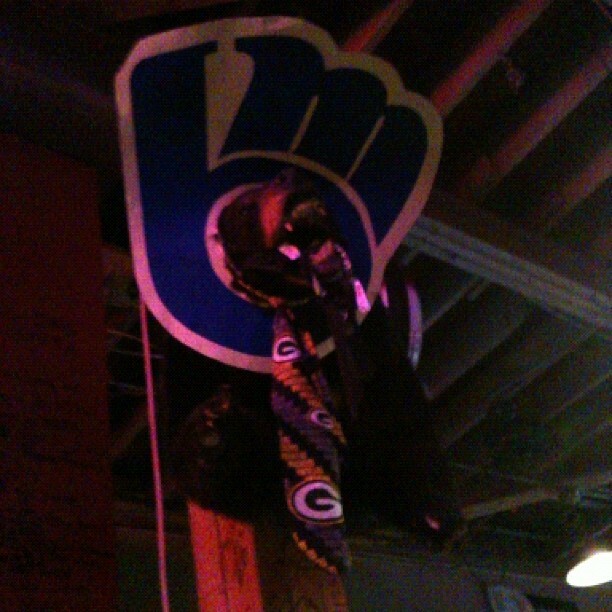 Excuse the crappy iPhone photo, but this stuffed bear head, busting through a Brewers sign, wearing a Packers tie cracked me up. Proving they not only reside on multitudes of Milwaukeeans' car bumpers and dumspters, I even picked out an "I Closed Wolksi's" sticker slapped up on the wall behind the bar. Ahhhhh... home sweet home. We chowed down on cheese curds (of course) and sliders before heading over to Coors Field for the Rockies game. The game was fun, and it's always nice to check another ballpark off the list. However, one thing I certainly do NOT enjoy is the park's ripping-off of Milwaukee's Sausage Races with their own version - sponsored by Comfort Dental. Because of the sponsor, the characters that "raced" (during the ninth inning?) were a tooth, a toothbrush and toothpaste. Seriously. Ugh. This is not my photo, but you just have to see the ridiculousness of it. I'm calling for a rumble between our beloved Klements racers and these floss-laced jokers. After the shock of the Comfort Dental race was over, we headed back to LoHi for a stop at Williams & Graham, a Prohibition-style bar tucked behind an unassuming book shop, where apparently you need reservations for a table to sit and drink. Their drink menu was massive, featuring old-timey classics like Manhattans and Old Fashioneds. Being the good Wisconsin girl that I am, I ordered a Brandy Old Fashioned sweet, which was delectable. I followed that up with my trusty favorite: a Moscow Mule. I don't have any photographic evidence, but the bar had great decor to go with its theme: leather-bound books adorning the walls, heavy velvet curtains, tufted leather booths and chair backs and dim lighting. 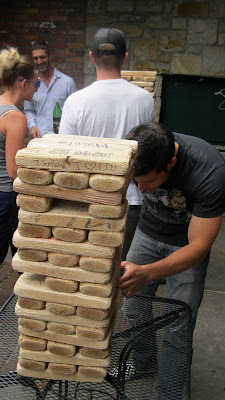 The only annoying thing about the bar was the jarring music they played did not suit its otherwise well-thought-out theme. Craving more Scott Joplin than Janet, I wish they'd played more '30s-era tunes, rather than modern rock. It took a lot away from the authenticity of the bar. The real entertainment were the bartenders, who put flair to their craft, slowly swirling gigantic ice cubes until they melted just right into each drink. A cool little place to end the night. The next day (Friday) was spent hiking in the Rockies (if you missed yesterday's post, here's my recap). 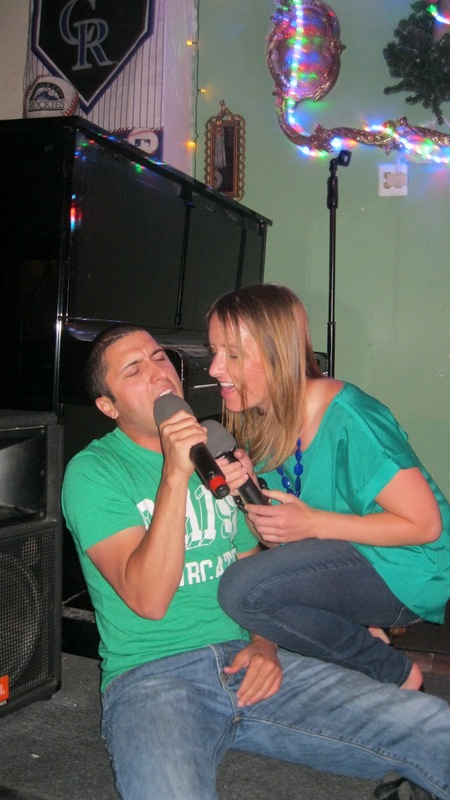 And after a brief nap, we headed downtown once again for a night of one of Eric and my brother's favorite pastimes: Karaoke. 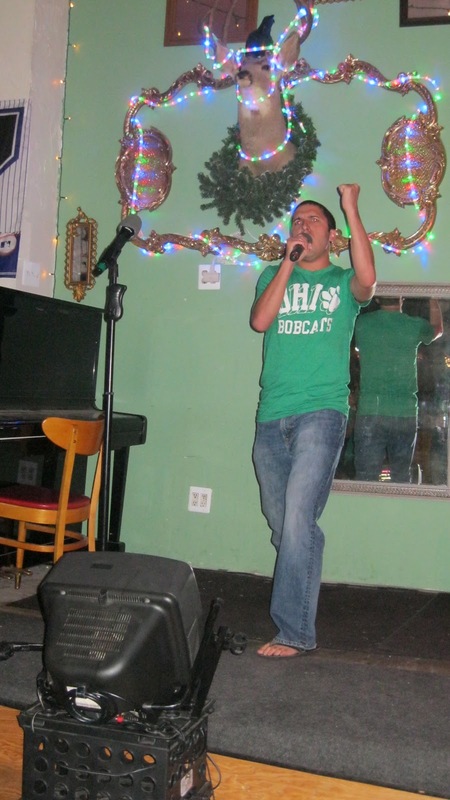 The establishment that hosted the nonstop karaoke jams was El Charrito, a favorite of my brother's, obviously because they favor him (he's a regular karaoke "star" there). Rob, Eric and company quickly submitted their song requests upon our arrival, and before long, Rob kicked things off in style singing all 10 minutes of Meat Loaf's "Bat Out of Hell." From there, all the stops were pulled out. 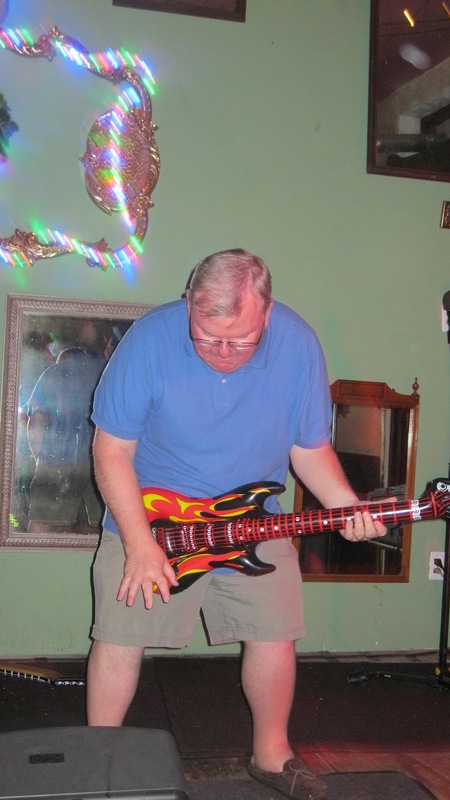 At one point, a portly, older gentleman took to the stage. We all braced ourselves, waiting to hear what this fella would be butchering for the night. 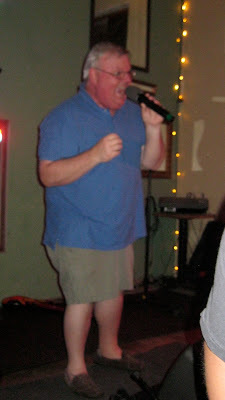 But from the very first note of his magical version of Styx "Come Sail Away," we knew we were about to experience a life-changing karaoke event. Paul Q. rocked. Hard. He had perfect pitch and flawless style. Just when we didn't think his performance could get any better, he shouted, just before breaking into the chorus, "Do you believe in angels?!?!?!" He brought the house down. Paul Q. gave one of the most amazing karaoke performances I've ever seen. His will forever be a legend in our minds. Almost as legendary as this beautifully-painted cut out of a pig holding a can of Pabst. Saturday was spent heading to nearby suburb Aurora, to visit Eric cousin, his wife and their new baby. We went to a local farmer's market, ate an incredible amount of tasty samples (and I brought home some famous Denver green chili! ), then went back to their gorgeous home for a lunchtime cookout on their deck. It was great to see them! After the cookout, we returned back to Denver and grabbed a cab back Downtown to visit what I think was Eric's highlight of the trip: A visit to 1-Up, a 21-and-over old-school arcade bar by the ballpark. 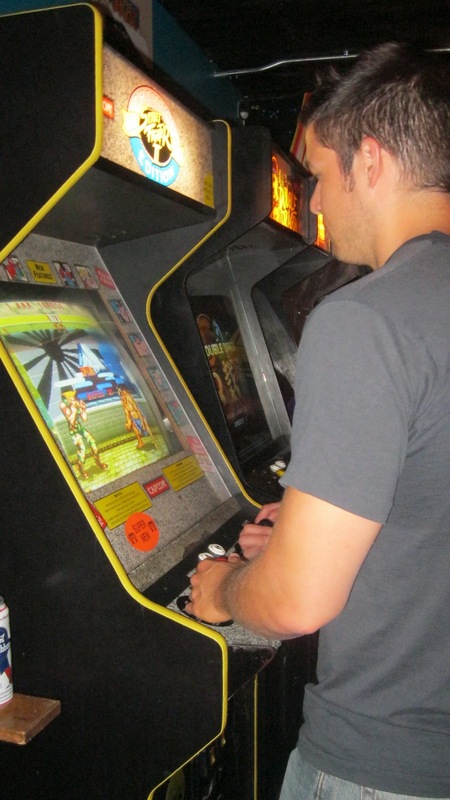 As soon as we walked in, I lost sight of Eric, as he blazed a trail straight over to the beloved game of his past: Streetfighter II. It was hysterical to watch the look on Eric's face as he traveled back to the days of yore, playing arcade games with complete strangers, wearing a smile bigger than any I'd ever seen him sport. Apparently, Streetfighter II was the most popular game in the bar, because it drew a huge crowd of onlookers, all wearing that same, nostalgic smile. Meanwhile, I played a game of Ms. Pac Man, Track & Field and pinball... not really excelling at any of them. 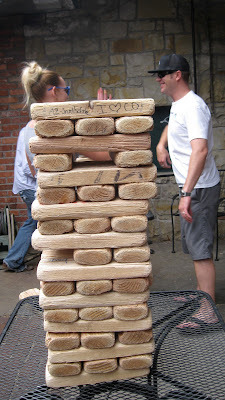 But my favorite part of 1-Up was the outdoor patio filled with tables for Giant Jenga! 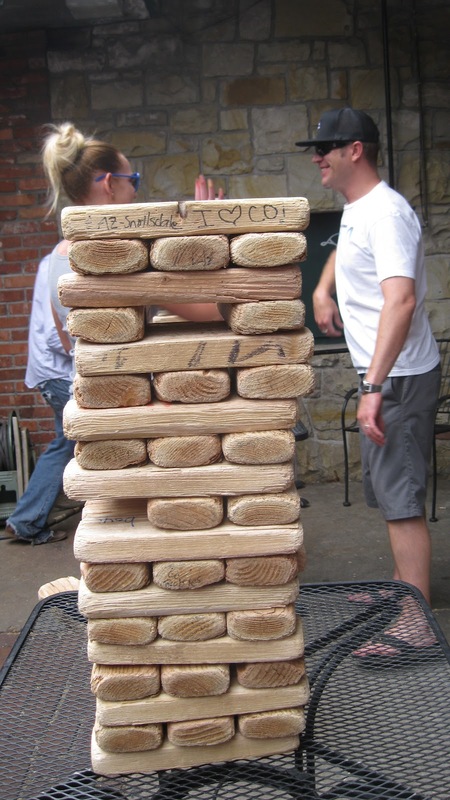 I could play Jenga for hours - I absolutely love the game, so of course I love it even more blown up five times its original size. We played a few rounds, which got pretty heated, before deciding we all needed some food. We ate at nearby Tavern, which had a huge rooftop patio looking across to Coors Field. After another drink and some mac 'n cheese, Rob, his girlfriend Meghan, Eric and I took off to catch the light rail back out to the suburbs to our next destination: Comedy Works. We had tickets to see SNL alum Jay Mohr perform stand up at Comedy Works' Tech Center location, but arrived there just before the opening act, Ryan Sickler, was to perform. The upstairs balcony, where we were supposed to be seated, was completely packed, so they had to scramble to find us another table - which they did, on the floor level in a cushy VIP booth. Luck kept swinging our way that night. The show was absolutely hilarious, and Jay's stand up was gut-busting with impressions of Peyton Manning in a wheelchair and absolutely dead-on impersonations of "30 Rock" star Tracy Morgan. But right before Jay went on stage, Comedy Works announced a surprise live-podcast was going to be taped right after the show at midnight. So after Jay left the stage, we moved down to a table right by the stage, ordered another drink, and got ready for the podcast, which was about an hour of Jay, Sickler and surprise guest Brad Williams popping out halfway through. I am SO glad we got this opportunity to catch the live podcast. It was hysterical to watch and such a fun experience. Because we left Comedy Works much later than anticipated, we had to rush back to the train station to catch our ride back to the city. Luckily, with a pit stop at Taco Bell on our 15-minute walk back to the station, we made the very last train leaving for downtown at about 2:45 a.m. And we caught it just in the nick of time. Once again, luck was in our favor that night! Because of our late night out Saturday night, we slept until about 10 a.m. the next morning, which is super rare for any of us. We grabbed lunch at the Highland Tavern, a cool, laid-back bar with a delicious-looking menu. Rob assured me it was home to the best burger in town (I always make it a point to find the area's best burger wherever I travel), so I ordered a burger with avocado and swiss and was not disappointed whatsoever. I was though, at this point, hungover, stuffed and ready to return to a normal schedule. So after a couple hours of wiffleball in the park, Rob took us back to the airport that afternoon, where few words were spoken, and both Eric and I were exhausted from our non-stop fun weekend in Denver. Thanks, Rob, for hosting us on such a fun trip! Denver's definitely a very cool city with so many places I'd still love to see. I can see why he loves living there so much! I'll definitely be going back, and I'll have my high-altitude lungs (and liver) ready for more. task is very difficult if you decide to tackle it on your own. The finance company convinced him to lease it for 4 years through them. Where they discuss truck driving and the many different parts and issues that make up driving a commercial vehicle, including truck driving jobs. modern tractors or trolleys, transportation heroes have shaped the country. and your family. After the training is completed, one has to undergo the procedure of applying for a CDL. Well written - really enjoyed reading it. If you have time please visit my Dentist Texas page.